Herbal medicinals that are beneficial in plant form see their benefits amplified in homeopathic form. Arnica is used as a component in massage oil, for instance. Calendula tincture is widely regarded for its assistance in healing wounds. Echinacea is an immune booster. So if you find yourself disappointed with a tried-and-true medicinal’s performance in a given situation, consider the homeopathic remedy made from that medicinal. My youngest, probably 3 years old at the time, tripped and fell chin-first into a sharp corner of a short table we used for kids’ crafts. I keep a homeopathic combination in a spray bottle that I call First Aid Spray–it is useful for cuts, bumps, that kind of thing. I pulled it out along with some gauze and dabbed the cut on my son’s chin for a while then held him through a nap. The cut was closed and not swollen, so when my son was up-and-at-’em after his nap, I thought all was well. However, when I brushed his teeth that night, I saw that the gum inside his mouth (inside where the cut was on the outside) was injured too, and it didn’t look great. I took him to the doctor the next day; she suggested an Echinacea-Calendula wash and some oral herbals to boost his immune function but by day’s end, his gum looked infected and certainly no better. 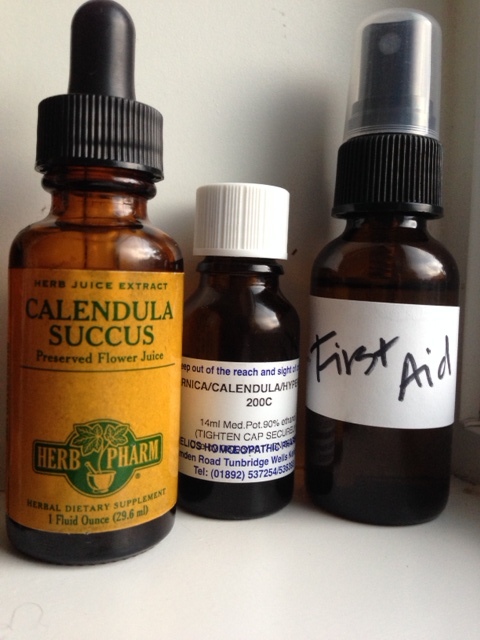 So in a moment of inspiration, I grabbed my First Aid Spray, which contains three homeopathic remedies including Calendula, pulled his lip down briefly to let the gum dry out a smidge (therein allowing the remedy water to be more readily absorbed into his gum), and spritzed. It typically takes the sprays 10-15 minutes to show results. Within 10 minutes, his gum was no longer swollen or red, and the puffy white gash that had been on his gum just looked like healed gum tissue. I’ve long used Ecinacea to support my immune system. Way back in 1995 I likely had undiagnosed [my doctor told me it was in my head] mononucleosis. Eventually, I insisted on testing and she found the titers for mono, indicating that I had had it and my immune system had tried to fight it off. Having worked full-time during that period, I ended up with Chronic Fatigue Syndrome, and my immune system got finicky. I typically needed 9 or more hours of sleep, but after that, if I ever got 7 hours of sleep or less, I’d get sick [like flu sick]. If I ever had coffee, even decaf, my lymph nodes would swell up and I’d be down for the count. So I looked for immune boosters and ended up figuring out that if I took Echinacea Purpurea or even Angustifolia [but it had to be the root] and Golden Seal [a nice boost but the Echinacea was more mandatory, the Golden Seal merely helpful] at the very first sign of illness [typically a certain feeling in my throat], I could ward-off the illness. I’d been using Echinacea [except during pregnancy and nursing] for at least 10 years, then, before I ever used homeopathic Echinacea. I was sick. Really really sick. The most bizarre aspect was that no matter how many covers I put on, I could not get warm. There I lay, with layers of clothes and layers of blankets, shivering in my heated house! 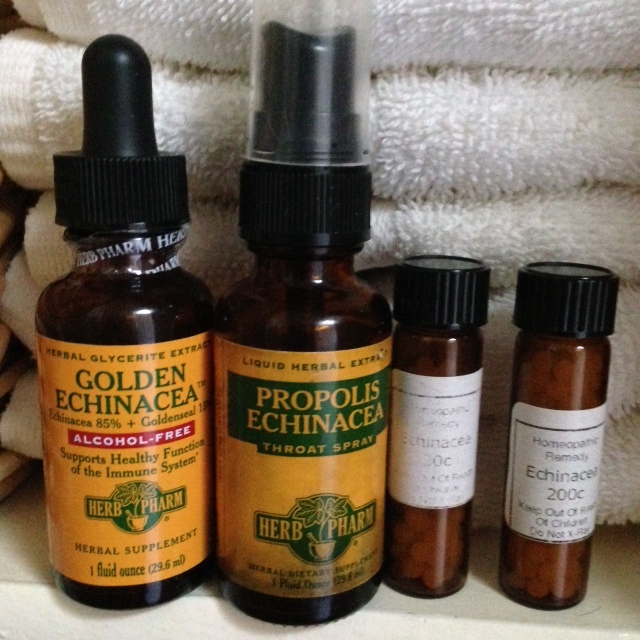 When I talked to my homeopath-at-the-time, John Melnychuck, he suggested I take homeopathic Echinacea. I think he said this super-chilliness reminded him of typhoid, actually, and that I should take the homeopathic Echinacea. I do not even know why I had that remedy, but for some reason he had sent me some previously so I did. Within 15 minutes of taking it, my body was able to regain its temperature and I was swiftly well again. I was absolutely amazed. By the way, I now use an herbal Propolis Echinacea Throat Spray [now called Soothing Throat Spray] at that very first sign of throatly discontent–mainly if I catch a chill–and the results are generally quite good.